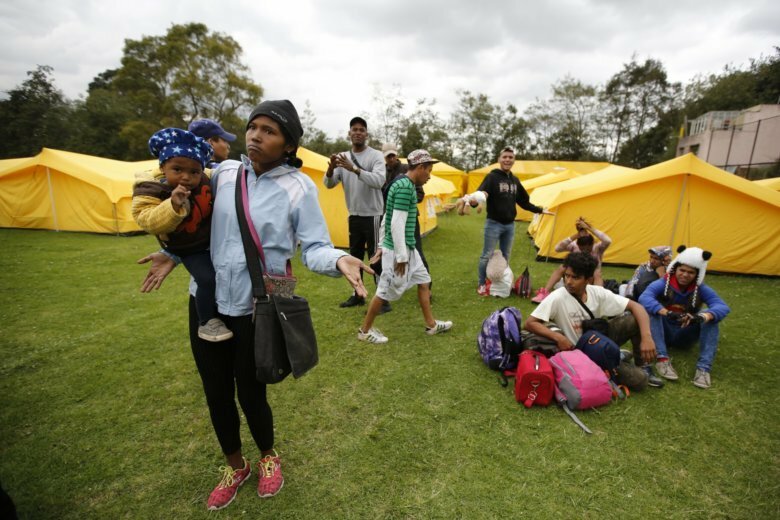 BOGOTA, Colombia (AP) — Colombian authorities moved homeless Venezuelan migrants to a soccer field filled with yellow tents and cots Tuesday, as the number of migrants fleeing their nation’s economic and humanitarian calamity has risen. The first migrant camp for Venezuelans in Colombia’s capital sparked a protest from residents who said they feared their new neighbors would bring crime and disease — the latest hint of escalating tensions throughout the region over the spillover of Venezuela’s crisis. Colombian officials had been reluctant to set up refugee-style camps, even while similar sites have been created at Ecuador’s border with Peru and in Brazil. The new camp is modeled after a temporary refugee settlement for Syrian arrivals in France. “There’s nothing else left to do,” said Cristina Velez, Bogota’s secretary for social integration. The migrants taken to the camp had been living in a park outside a bus station in conditions considered a potential public health risk. Families with young children were living cramped together alongside railroad tracks and cooking food over makeshift fires. Many had reached Bogota after long walks by foot and didn’t have enough money to rent a room. “We are going step by step because everything has changed very quickly,” she said. The arrival of so many Venezuelans has sparked xenophobic attacks throughout the region. Last month, a group of Venezuelans living in Colombia’s capital said a mob beat a man to death and ransacked their homes while shouting slurs against foreigners. In Brazil, violence erupted after a local storeowner was stabbed and beaten in an assault blamed on Venezuelan migrants. As officials transported the Venezuelans to the new camp in Bogota, a dozen angry residents stood in front of a gate attempting to block their arrival. Residents in a large new condominium sat on their balconies now overlooking a field of yellow tents and cots and took photos. Several said they were angry officials hadn’t given them advance notice while others worried Venezuelans would take their jobs. “I’m going to be left with nothing,” said Esperanza Contreras, 60, who sells grilled corn and said she feared Venezuelans willing to work for less would steal her customers. “Not even animals should be there!” Giovanna Sanchez, 35, shouted into a microphone outside the camp. “I feel trapped here,” she said.